It’s obvious that Niagara Falls is a place that is attractive to any kind of vacation-goer. Relaxers, explorers and revelers alike can find the perfect attractions to help them unwind. If you are a type who enjoys experiencing the great outdoors, you must know about all the astoundingly beautiful hiking opportunities at the falls and nearby spaces. However, even if you are a true nature lover, you still might not know what critters you might find living amidst the falls’ surrounding parks and forests. Here’s a short list of the wildlife you might spot while you’re wandering around the falls during your fantastic Niagara Falls vacation. The New York side of the falls has plenty to offer those looking to find life in the waterways alongside hiking or riding trails. Literally hundreds of different fish species inhabit the waters around Niagara Falls. Avid anglers or astute students of aquatic life might be able to discern in particular the abundant lake trout, lake salmon, small- and largemouth bass and panfish. 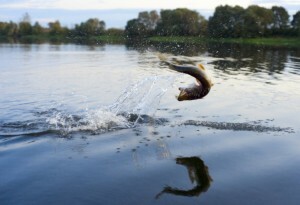 With the right permits, you might even be able to catch some for dinner! It seems that any bird can be majestic, but that doesn’t bar us from claiming that our own feathered friends are particularly grand. At any rate, the falls region can truly boast more than 300 species of wild bird, many of which are endangered or at-risk. You’ll easily spot the bright feathers of common birds such as cardinals, blue jays and robins. Plus, the ornithologists in your group will probably be able to distinguish the finches, thrushes and chickadees that almost overwhelm our trees’ branches. The indigenous birds of prey, for those who enjoy the adrenaline and excitement in bird-watching, include turkey vultures, hawks and several species of owls. 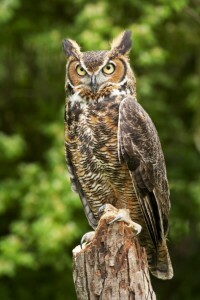 If you’re lucky, you might be able to see a great horned owl, one of the larger and more recognizable of the owl family. Larger and more familiar birds of the region include the ubiquitous Canada goose and heron, which children will enjoy identifying. The plentiful ducks are always a family favorite, as well, though we ask you not to feed any wild animals you may spot on your travels. Mammals in the region make up as many as 53 species, and almost all of them have familiar names. Most of our mammals are small and furry: among other small rodents, squirrels, raccoons and even skunks — though you need not worry much about being sprayed if you stick to proper wildlife etiquette. If you’re quiet and respectful, you may be able to spot white-tailed deer or red foxes. At one time, you might even have caught a glimpse of a black bear or mountain lion, though many of these hunters have been driven out of the region by development and human activity. Many of the mammals in the area are accustomed to human presence, but again we ask that you refrain from feeding the wildlife; we want to keep the animals happy and healthy in their own habitats, and encouraging comfort with humans prevents our furry, feathered and scaly friends from living a satisfying life.